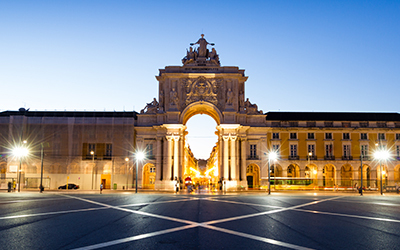 Welcome to Lisbon, Portugal’s enchanting capital. Get settled in at your carefully selected luxury hotel and prepare to be dazzled by Lisbon’s alluring mix of charming locales and contemporary vibe. Head out to explore the city and discover sights like Castelo de Sao Jorge, the Moorish castle that overlooks the city’s historic center and Tagus River. Wrapped around the castle’s slopes you’ll find the Alfama, Lisbon’s oldest and most atmospheric neighborhood – walk around its winding alleys an take in traditional Portuguese street life. Stop in at the Calouste Gulbenkian Museum, a fascinating museum that holds an amazingly diverse collection of artifacts. During your stay in Lisbon be sure to visit Belem, a district with significant maritime history and home to the Belem Tower, as well as the sublime Jeronimos Monastery built to celebrate the achievements of the great Portuguese explorers. If you find yourself with enough time, take a day trip to the magnificent resort town of Sintra. Sitting at the foothills of Portugal’s Sintra Mountains, the rolling hills of the area are dotted with palaces, villas and impressive gardens. As your city discovery comes to an end, be sure to take some time to relax and get better acquainted with local Portuguese life. Head to the area of Baixa to find some of the most interesting shops and cafes in Lisbon, and then climb up the Avenida da Liberdade until you’ve reached the beautiful Eduardo VII Park. In the evening visit the lively Bairro Alto to find some of Lisbon’s best bars and fado clubs. To conclude your True Lisbon holiday, your True Trips travel expert has planned a lovely dinner at one of Lisbon’s finest restaurants. Lisbon is a fascinating European capital waiting to be explored!